Did you know that Thanksgiving as celebrated today resulted from one of the most awesome holiday content marketing campaigns ever? Despite what you learned in elementary school, the first harvest feast between the Pilgrims and the Wampanoag Native Americans in 1621 lacked turkey and pumpkin pie! Our Thanksgiving holiday traditions were actually created by a smart content marketer named Sarah Josepha Hale in the mid-1800s, 200 years after the Pilgrims’ first harvest dinner. So let’s examine Hale’s holiday content marketing campaign to see how she created today’s Thanksgiving holiday traditions. As a result, you can apply them to your business. To put Sarah Josepha Hale’s work as a brilliant content marketer into perspective, let’s examine her platform. To take advantage of the growing audience of American women, Louis Antoine Godey created his magazine Godey’s Lady’s Book in 1800. In 1836, he purchased American Ladies’ Magazine to increase its reach. Philadelphia-based Sarah Josepha Hale became the publication’s editor in 1837, a post she held until 1877. Mrs. Hale brought a strong sense of purpose and editorial principles focused on social inequalities and women’s education to Godey’s Lady’s Book. Under Mrs. Hale’s editorial guidance, Godey’s magazine grew from 10,000 readers to a pre-Civil War circulation of 150,000. Known as the “Queen of Monthlies” Godey’s Lady’s Book, influenced 19th century American life and culture. In addition to its hand-tinted fashion plate at the beginning of each issue, the magazine content described current trends. As the editor of Godey’s Lady’s Book, Hale became known for fashion, reading and cooking trends. In the process she became one of the most influential editors of her time. This made Godey’s the standard for manners while shaping American traditions. The first harvest meal that the Pilgrims and Wampanoag Native Americans shared likely consisted of lobster, seal, swan and corn. Due to the lack of sugar and ovens, no holiday sweets such as pumpkin or apple pie could have been baked. But more importantly, this first harvest celebration marked the beginning of a 50 year alliance between Europeans and Native Americans. George Washington legislated the first Thanksgiving Day be observed on Thursday, November 26th, 1789. It marked gratitude for the end of the Revolutionary War and ratification of the Constitution. But this holiday lasted only one year, although Presidents John Adams and James Madison proclaimed similar holidays. While some northern states had established Thanksgiving holidays on different dates, this holiday tradition never extended to the southern states. After reading about the Pilgrim’s feast Sarah Josepha Hale started her content marketing campaign to establish Thanksgiving as a national holiday in 1827. She published turkey and pumpkin pie recipes. She also wrote editorials annually to build public support for these new Thanksgiving traditions. For 36 years, Hale used a combination of editorial content and letter writing campaigns to persuade governors, senators and presidents to create a national Thanksgiving holiday. In 1863 the midst of the Civil War, President Abraham Lincoln used Hale’s holiday suggestion. He proclaimed the last Thursday in November as a day of thanksgiving. As editor of Godey’s Lady’s Book,Sarah Josepha Hale influenced women’s issues and cultural trends. Hale’s Thanksgiving holiday content marketing campaign worked for 5 key reasons. Examine these tactics and apply them to your content marketing. As a popular magazine, Godey’s Lady’s Book reached an audience of 150,000 women before the Civil War. Even in today’s content rich landscape, many businesses and content marketers today would love to have an addressable audience of this size. Further, Godey’s readers actively wanted the information. Its subscribers paid a whopping $3 per year. To put this in context,The Saturday Evening Post charged $2 per year. As a result, Hale was the equivalent of a YouTube star of her time. Unlike today’s YouTube stars, Hale had few magazine competitors. 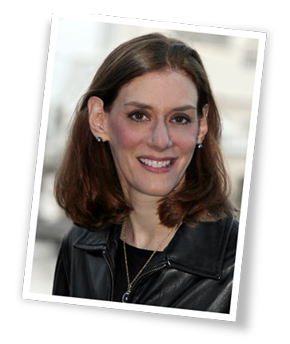 Like any successful content marketer, Hale focused her editorial calendar on women’s issues, namely fashion, home and education. In contrast to content marketers now, Hale had few competitors so that she didn’t need to define her niche more granularly! Like any magazine, Godey’s Lady’s Book followed a regular publishing schedule. By delivering information on a consistent basis, Godey’s created Share of Audience Attention (aka: SOAA) and anticipation for its information. Also, each issue of Godey’s provided additional content of value. Specifically, the magazine included an illustration of a garment and the pattern describing how to make it. It even provided sheet music for the piano. Readers saved back issues! Further, to get Thanksgiving designated as a national holiday, Hale regularly wrote to politicians in support of her cause. 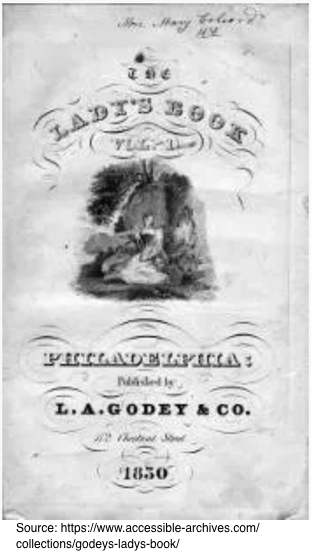 Beyond its focus on “women’s issues”, Godey’s Lady’s Book provided a publishing platform for top literary writers. Its contributors included Harriet Beecher Stowe, Edgar Allan Poe, Nathaniel Hawthorne and Henry Wadsworth Longfellow. In 1847, Godey started copyrighting the magazine’s content to keep other magazines from stealing it. While angering competitors, this marked the first use of copyright in the US. Acting like the Medium of its time, Godey’s and Sarah Hale, in particular, gained respect from top authors and poets. As a result her influence increased. Hale used the first Thanksgiving celebration in Plymouth as historical basis for her content. But she molded the facts to make a cultural case to her readers. Hale provided recipes and cultural features focused on turkey and pumpkin pie, foods not present at the original celebration. Ultimately at 74, Hale’s holiday content marketing campaign finally achieved its goal. She persuaded President Lincoln to create a national Thanksgiving holiday. But he did so because he faced a deeper challenge, a deeply divided country torn apart by a brutal civil war. Lincoln used Hale’s Thanksgiving celebration as a way to heal his divided country on a more spiritual basis. In 1863, he made Thanksgiving an official holiday to be observed on the last Thursday in November. 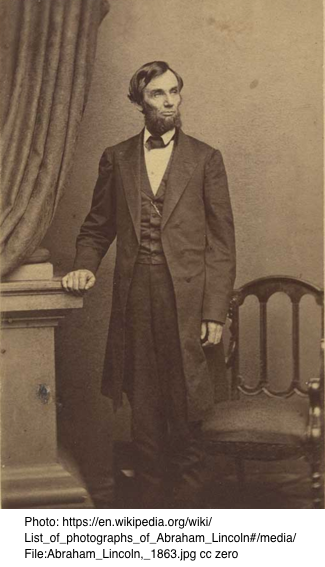 He set the date to honor of the widows, orphans, mourners and sufferers in the Civil War. BTW, in 1864, Lincoln’s proclamation was sold to raise money for the Union troops, a move that Joe Pulizzi would support fully! 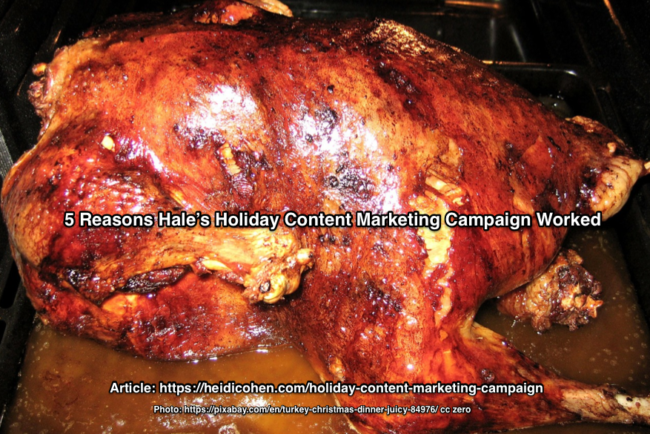 Take a page from Hale’s Thanksgiving playbook to develop and enhance holiday content marketing related to your business. With the new year in planning range, use these content marketing tactics to build your editorial calendar for next year. At a minimum, add one marketing hook per month for B2C businesses and one per quarter for B2B businesses. 5 Actionable Holiday Content Marketing Campaign Tactics. Examine history and traditions within your company, category and/or location. Like Sarah Hale, tap into existing practices. By going beyond your business, you avoid making the celebration appear too promotional. Further it helps build audience anticipation. Make the holiday meaningful to your audience. Align your events with your audience’s beliefs and interests to enhance its value. Make it a point to know what’s happening in the communities you do businesses in. Get peers and frenemies to support your holiday. Don’t go it alone! For example, aligned with their content marketing, American Express (aka: AMEX) created Small Business Saturday to help their merchants drive business. Create related content. Like Sarah Hale offer “How To”content. Include a variety of types of images and illustrations to make the content more alluring. Where appropriate make this content evergreen so that you can use it year after year. Extend your content marketing to live events and experiences. 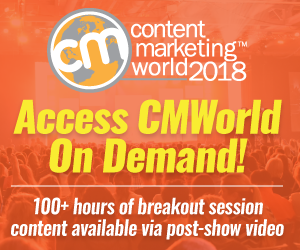 Go beyond sales-driven content. Give people a reason to visit your business or retail store. For example, many department stores have a Santa to attract children pre-Christmas. Sarah Josepha Hale was a brilliant content marketer whose goal to make Thanksgiving a national holiday extended beyond her lifetime. Despite her embellishments, Hale offered her readers “How To” content to recreate Thanksgiving traditions in their homes and families. To help your readers, examine your content marketing plans and editorial calendars to determine where you need celebrations or promotional hooks. At a minimum use existing holidays to fill your editorial calendar. Instead of adding another promotion and forgetting about it, create evergreen content that you republish or repromote annually like the Christmas movies you watch every year. Use these content marketing tactics to build your company and/or local holidays and related content. PS: As a marketer, you may be interested to know that, during the Great Depression, President Franklin Roosevelt moved Thanksgiving to the third Thursday in November to jumpstart holiday sales. But swayed by popular opinion, Roosevelt moved the holiday back to the fourth Thursday in November in 1941. Tags Abraham Lincoln, George Washington, Holiday Content Marketing, Pilgrims, Sarah Josepha Hale, Thanksgiving. Bookmark the permalink.